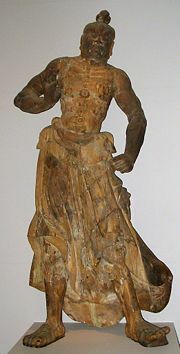 This wooden Kongorikishi statue was created during the Kamakura shogunate during 14th century Japan. It originally guarded the gate to Ebaradera, a temple in Sakai, Osaka. The Kamakura shogunate (Japanese, Kamakura bakufu 鎌倉幕府) was a feudal samurai government from 1185 (or 1192, when it was formally recognized) to 1333. The term "Bakufu" as a form of government was, however, coined in the late Edo period (1603 - 1867). The rise of samurai and their control of political power was a turning point in Japanese history. In the previous Heian period (794-1185), the Tenno (“Heavenly Enperor”) and aristocrats had ruled Japan, and literature and culture had flourished among the aristocrats. The samurai gradually gained power late in the Heian period and created a federation of local leaders and regents led by Minamoto no Yoritomo. Yoritomo’s group defeated the ruling Taira Family, and gained control over the government. Samurai found their excellence not in material wealth, as the aristocrats did, but in the spirit of simplicity and fortitude. Yoritomo’s group set up their government office in Kamakura prefecture in the eastern part of Japan, and established a new system of governance, the Bakufu, based upon these values of simplicity, fortitude, and fairness. This emphasis on a moral value system in the government induced a religious renaissance. Buddhist leaders such as Honen, Shinran, Dogen, Nichiren, and others emerged and presented a variety of teachings whose primary focus was the salvation of people. Samurai also found an affinity with the spirit of Zen Buddhism, and its philosophy became central to the Samurai lifestyle. By giving up material wealth, the Samurai-run government continued until the Meiji restoration. The spirit of simplicity and fortitude is still valued and expected of leaders in Japan. The type of team management exemplified in the Bakufu became a characteristic of Japanese management philosophy. The primary sources for this period are two works written by two different authors from two different perspectives. One is “Azumakagami” (吾妻鏡 or 東鑑), 52–volume historiography written by an unknown samurai in Kamakura. Another is “Gyokuyo” (玉葉), a diary written by Kujyo Kanezane, an aristocrat of the Imperial Court. Historians reconstruct the history of this period primarily based upon these two primary sources. Before the establishment of the Kamakura bakufu, civil power in Japan was primarily held by the ruling emperors and their regents, typically appointed from the ranks of the court and the aristocratic clans that vied there. Military affairs were handled under the auspices of the civil government. However, after defeating the Taira clan in the Battle of Dannoura which ended the Genpei War in his favor, Minamoto no Yoritomo seized power in 1185 and became the de facto ruler of the country. He asserted the primacy of the military side of the government and was given the title of shogun (征夷大将軍) in 1192 while the system of government he established became formalized as the bakufu (literally, tent-government). The Japanese provinces became semi-autonomous under the new protectors (shugo, 守護), the predecessors of the daimyo. Protectors were selected mostly from powerful families in the different provinces, or the title was bestowed upon a general and his family after a successful campaign. Although they managed their own affairs, in theory they were still obliged to the central government through their allegiance to the shogun. 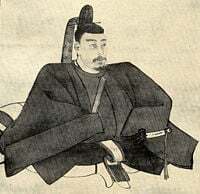 After Yoritomo's death, Hōjō Tokimasa, the chief of his widow Hōjō Masako's clan and former guardian of Yoritomo, claimed the title of regent to Yoritomo's son Minamoto no Yoriie, eventually making that claim hereditary to the Hōjō clan. The Minamoto remained the titular shoguns for two more dynasties, with the Hōjō holding the real power—thus ruling through a puppet shogun and a titular emperor. The Emperor attempted to reverse the situation in a 1221 rebellion (called the Jōkyū War), but failed to wrest power away from the shogunate. This solidified the hold of the Hōjō family on the shogunate, even to the point of allowing them to pick and choose successors to the title of shogun, which, following the Jōkyū incident, was assigned first to members of the noble Kujo family, and later to members of the imperial household until the end of the Kamakura bakufu. The Mongols under Kublai Khan attempted sea-borne invasions in 1274 and 1281 (see Mongol invasions of Japan); these were successfully repelled by the shogunate with the aid of kamikaze (typhoons), but the strain on the military and the financial expenditures weakened the regime considerably. A second attempt was made by the Imperial court in 1331 under the rule of the Emperor Go-Daigo, and was much more successful, particularly as Kamakura's most powerful general, Ashikaga Takauji, chose to side with the Emperor. A member of the Hidatori family, who died in 1332, left a large part of Shikoku in a state of civil war. Ashikaga Takauji brought this war to end. This was the last successful campaign of the Kamakura Shogunate. The Kamakura bakufu came to an end in 1333 with the defeat and destruction of the Hōjō clan. This triumph was, however, short-lived, as Ashikaga Takauji promptly assumed the position of shogun himself, establishing the Ashikaga shogunate. Shinoda, Minoru. The Founding of the Kamakura Shogunate, 1180-1185. New York: Columbia University Press, 1960. This page was last modified on 2 April 2008, at 10:11.